Multi-function colour printers that are durable, reliable and fast. Extensive mobile connectivity options maximise productivity. 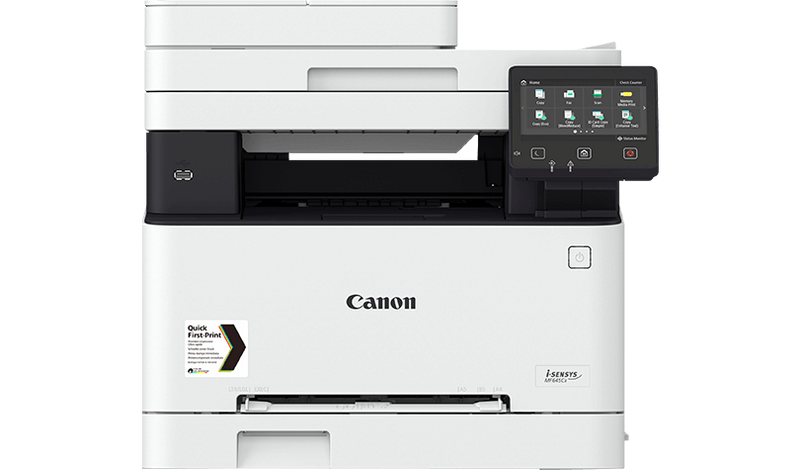 Optimised for small offices, the Canon i-SENSYS MF640 Series delivers high-quality colour printing, scanning, copying and faxing (MF645Cx). Hardworking, resilient and fast, they also feature intelligent mobile connectivity options. Multi-function colour printer that is optimised for small and medium businesses. Durable, reliable and fast, the MF641Cw also features a large colour touch screen and a compact design. Multi-function colour printer that is optimised for small and medium businesses. Durable, reliable and fast, the MF643Cdw features extensive mobile connectivity, automatic double-sided printing, and fast 21 ppm A4 print speeds to maximise productivity. Multi-function colour printer with fax that is optimised for small offices. Durable, reliable and fast the MF645Cx also features extensive security and cost management capability, as well as single pass double-sided scanning. Multi-function colour printer that is optimised for small and medium businesses. Durable, reliable and fast, the MF641Cw also features a large colour touch screen and compact design. Multi-function colour printer designed from the ground up for small and medium businesses. The MF643Cdw includes enhanced copy and scanning features as well as automatic double-sided printing and extensive mobile printing options. Durable, reliable and fast, the MF645Cx is a multi-function colour printer with fax capability, ideal for small and medium businesses. MF645Cx also features extensive security and cost management options, as well as single pass double-sided scanning to boost productivity.